Peruvian-American tenor Christopher Sierra is recognized for his artistic sensitivity and versatility in repertoire ranging from Handel, Mozart, and Donizetti to Popov, Morrison, and contemporary premieres. He has performed with Santa Fe Opera, Opera New Jersey, Spoleto Festival USA, Princeton Festival Opera, Long Island Opera, and New York Lyric Opera Theater, among many others. 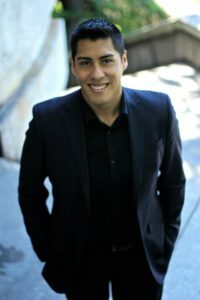 On the concert stage, Dr. Sierra has performed works such as Schumann’s Spanisches Liederspiel, Britten’s Les Illuminations, Bach’s Weihnachts Oratorium, Haydn’s Lord Nelson Mass, Brahms’s Liebeslieder Walzer, Vaughan Williams’s Serenade to Music, and Schubert’s Mass in G. Recent engagements include performing as a featured soloist with The Harlem Chamber Players and the Palouse Choral Society. He is also an active recitalist and was invited to perform mélodies by Henri Duparc at the 2018 College Music Society Pacific Northwest Regional Conference. As a recording artist, Dr. Sierra can be heard on The Flower of Beauty (2009) with the Westminster Choir, Landscape: Choral Music of Gerald Custer (2008) with Anam Cara, and Teaching Music Through Performance in Choir, Volume 2 (2007) with the Grammy-nominated Westminster Williamson Voices. He has sung under the baton of Pierre Boulez, Leon Botstein, Christoph Eschenbach, Ton Koopman, Lorin Maazel, Kurt Masur, David Robertson, John Rutter, Emmanuel Villaume, and Franz Welser­-Möst during his time as a member of the Westminster Symphonic Choir, MidAmerica Productions, and New York City’s MasterVoices. A frequent guest clinician, Dr. Sierra has presented vocal master classes, choral workshops, public lectures, and scholarly performances at institutions such as Florida International University, Iceland University of the Arts, Lewis-Clark State College, University of Idaho, the Washington State University Choral Festival, and the Idaho Music Educators Association District II Elementary Music Festival. His voice students have placed in National Association of Teachers of Singing (NATS) competitions and have been accepted into notable training programs. Dr. Sierra currently serves on the voice faculty at The College of New Jersey. He has taught applied voice at Columbia University, Monmouth University, Rutgers University, and Washington State University, as well as general music and choral ensembles at Hunter College Elementary School, 51st Avenue Academy, Yorkville East Middle School, and William Tennent High School.